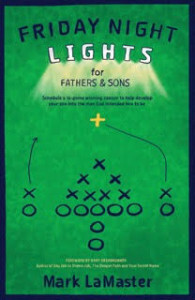 Mark LaMaster's purpose and passion is to help good dads become GREAT dads by providing intentional, biblically based activities to help them raise their sons to become godly young men. Mark is also the founder of Playoff Parenting, LLC, whose mission is to help transform well-intended, passive parents into active and intentional Playoff Parents who teach valuable, Christian-based lessons to their children. Mark LaMaster describes himself as a K-Love listenin', Dave Ramsey recommendin', Bulletproof Coffee drinkin', Nebraska Football followin', Jeep Wrangler drivin', high handicap golfin', God-fearin' father, husband, and son who wants to share his failures and successes to help you improve your relationship with your son. He seeks to bring you both closer to God. Mark lives in Minnesota with his beautiful bride, Jen, and two amazing children, Hannah and Lincoln.